If you get lost or in an emergency, YOU NEED A MAP! A map that works everywhere even without a cell phone signal. A map that shows not just roads but also terrain, streams, lakes and other landmarks. A map that covers the entire USA, all 50 states. Note: If you would prefer a small app that caches online maps covering the entire world, please tap on the Related tab and try the free Scenic Map app. Get You Need A Map if you want an offline map the entire USA as a single large download. Sure, your iPhone has a great built in map but all it takes is one wrong turn and you could find yourself stuck in the snow behind a locked gate with no cell phone signal. What is the fastest way back to the highway? Should you go forwards or back? Is there a better road just a short distance away? Is there a raging stream or an steep cliff between you and the road? YOU NEED A MAP! You Need A Map is a huge application. It has to be. It contains every mountain, hill, stream, lake, pond, freeway, highway, local road and track. In addition it contains many buildings, trails, railways, points of interest and polygon features. It has everything you need to find out where you are and what is around you anywhere in the USA. Most navigation apps on the iPhone and iPad must transfer all their maps from servers on the internet. This can be slow in areas with only 2G coverage or completely unavailable in wilderness areas where a map would be most useful. 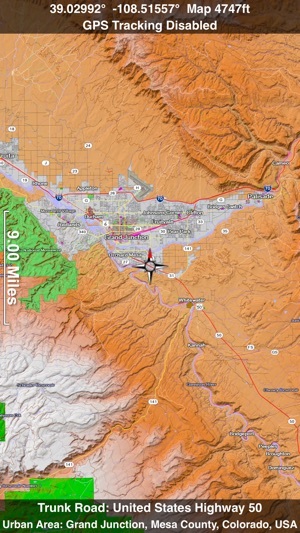 You Need A Map solves this problem by storing maps directly on your iPhone or iPad. This extremely fast high quality software renderer is the first of its kind for mobile devices. 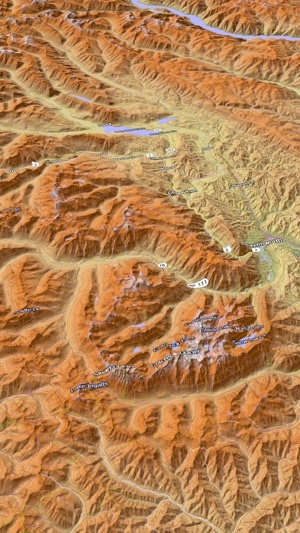 If you do have a cellular or WiFi internet connect, Satellite image overlays add breathtaking detail and realism to the maps (tap preset 2 or 4 when Online Map is enabled). You can use them as you travel to see what is hidden from view at ground level. This takes moving maps to a whole new level. Tap the arrow in the toolbar to enable GPS tracking. As you move, you will generate a track file which you can replay. 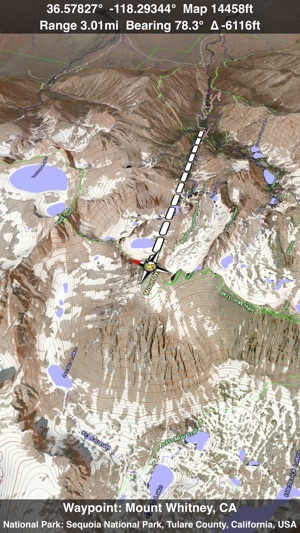 You can also import GPX tracks generated in other programs and play them. While recording or playing a track, the map will be centered on the current location and rotated towards the direction of travel and rendered in 2D or 3D with silky smooth animation. When playing a track, you can speed up, slow down, pause, restart or skip to the end. Send your GPX tracks to other apps or email them. You Need A Map uses the same code as Scenic Map and has most of the same features. These include many map customization options, customizable waypoints, direction and bearing information, a smooth scrolling moving map display while driving or flying, city search and much more. You can also get the full feature set of Scenic Map with an in-app purchase including the new online maps of the entire world. You Need A Map supports GPS tracking while the app is in the background. Excellent! Just used this app on a scenic mountain drive. Not having to worry about losing date in the mountains is a great piece of mind and the 3D topo greatly enhances situational awareness. I also find not using turn by turn directions to be less intrusive, especially for a spontaneous drive. Just use the GPS location and the ground track to make sure you don't make a wrong turn somewhere. Can't wait to take this hiking. Stops after 49 miles or minutes? The latest update doesn’t stay locked. I track my rides and after everytime, there is no recording after 49 miles or 49 minutes, odd. I have used this app exclusively for a few years and recommend it highly. Same on all devices, all devices and apps up-to-date so what’s up developers? Kinda annoying to reach into my leather jacket and my gps tracking stopped. 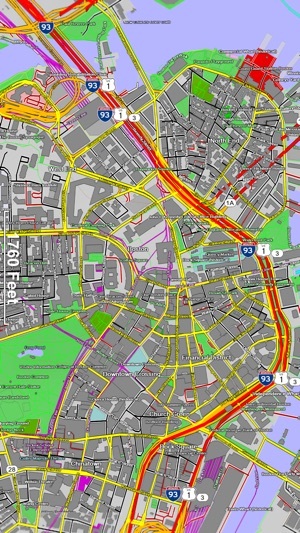 If you just need city and big highway maps then download anything. They're all the same. 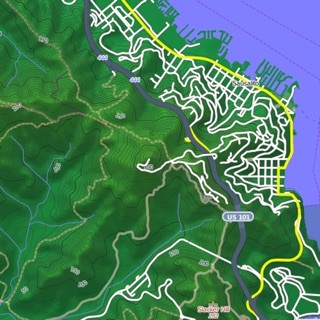 BUT if you get off-road or deep into the back country GET THIS APP. I've tried many. This beats them all.